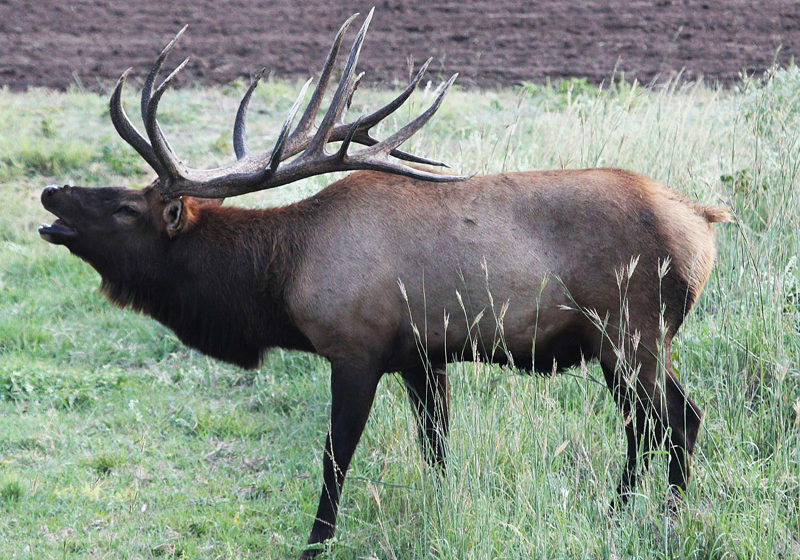 Editor’s Note: Prior to the European settlement of the U.S., more than 10-million elk lived in most of the U.S. and parts of Canada. 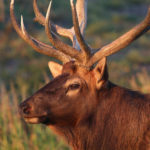 Today about 1-million elk live in the western U.S., Wisconsin, Michigan, Minnesota, Missouri, Pennsylvania, Arkansas, Kentucky, Tennessee, Virginia and North Carolina as well as sections of Canada. 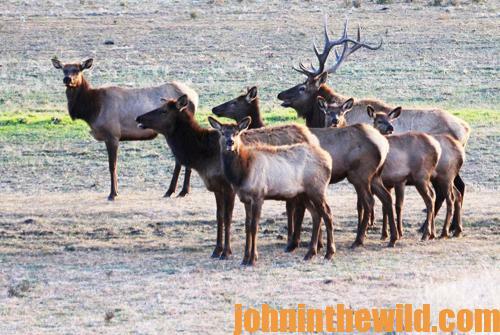 Elk live in a variety of habitats, from rain forests to alpine meadows and dry desert valleys to hardwood forests. 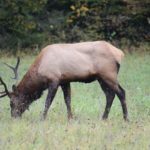 Since elk season starts in some of these states in August, John in the Wild wanted to give you the latest information on preparing to hunt elk. Brian Mosley, from Bloomfield/Farmington, New Mexico, in the northwestern corner of New Mexico, says, “What I like about where I live is I’m 55 miles from Colorado, 1-1/2 to 2 hours from Utah and a 1 hour, 15 minute drive from Arizona. 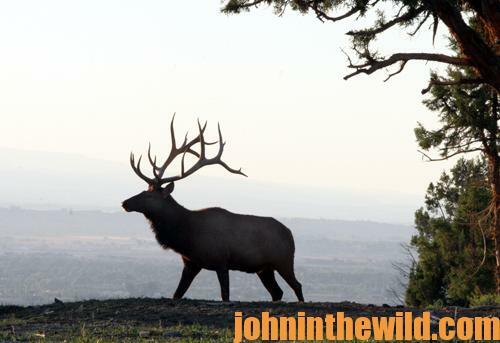 I can drive to any one of these states, hunt elk and drive home after the hunt. Plus, if I take an elk, I can get it back home quickly. 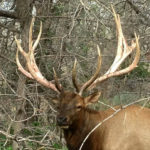 Another advantage about where I live in New Mexico is in Colorado that has some of the most elk in the western states, I can buy an over-the-counter elk tag.” Mosley has been hunting elk for 17 years and has taken 15 elk – 98% of those with his bow. Mosley’s an avid elk hunter who’s a football and track coach, as well as a strength-and-conditioning coach. 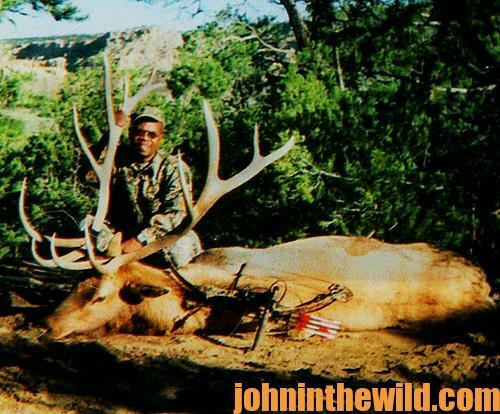 I’d planned a hunt in Colorado for myself and my 15-year-old son Kenyon, who had a deer tag. I had an elk tag. Prior to this hunt, I realized I might have to help carry out an elk and a mule deer if Kenyon took one. So, I wanted to be in the best shape possible. I started getting in shape for this hunt well in advance of the hunt. Because I’m a strength-and-conditioning coach, a football and a track coach, I knew that to perform at my best I had to get in the best shape I could be before the hunt. 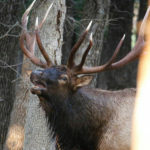 I started training for the Train to Hunt Competition (http://www.traintohunt.com), a relatively new type of 3D archery competition that started and that was designed for bowhunters, especially elk and mule deer hunters, to simulate the tasks that these western hunters may have to perform, if they have successful hunts and harvest animals. These competitions are held in all the western states. You also can learn more at the Facebook page https://www.facebook.com/traintohunt. Not only did I want to get my body and mind in shape for the hunt, but because I also shoot competitively for PSE (www.pse-archery.com), I liked the idea of competing in a new form of 3D archery. I’m always looking for that next challenge or the next new type of archery competition. I liked the idea of an archery competition that would help me prepare mentally, physically and with my bow for this hunt with Kenyon. Kent Claremont from Oregon started the Train to Hunt Competition. 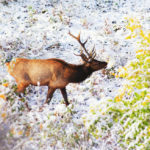 These competitions are designed to challenge your body and your mind for hunting and shooting in the high country. Train to Hunt is a bowhunter competition for archers who shoot either traditional archery or compound bows. This competition has several different challenges. * draw and shoot at targets often uphill or downhill, while sitting flat on the ground. 2) Meat Carry – The second competition is called a meat carry. Depending on your age, you may have to carry a pack that weighs from 25 – 80 pounds. Because I’m in the Master’s Class, I have to carry an 80-pound pack over a 2-3 mile course to simulate carrying the meat out after I’ve taken an elk. 3) 3D Challenge – The third day is the 3D challenge. You’ll wear a pack that weighs 20 to 25 pounds on your back and must run to six different stations over a 2-3 mile course. At every station you stop, look at a 3D target, guess the distance, take the shot, and then follow the shot by a certain type of designated exercise like step-ups, push-ups, burpees and carrying a 100-pound bag 100 yards. Next you have to turn around and carry that same bag back to the starting point. 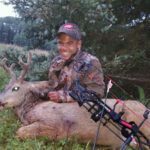 On the first day of this hunt, Kenyon took his first buck – a forked-horn buck – with his PSE Chaos bow at 23 yards – not far off the trail. Other than the day when Kenyon was born, this was the greatest day of my life. We were only about 1/2–mile from where we’d left the truck. I got the truck fairly close to where the buck was. After field dressing him, we dragged him to the truck, loaded him up, left the woods, drove back home and finished butchering the buck. Happy and proud of his buck, Kenyon stayed home the next day. Besides, I think he thought his dad was crazy for climbing around in all the mountains that I hunted. I left my truck at the same place where I’d left it the previous day and walked 2 miles farther into the woods from where Kenyon had taken his buck. I didn’t see any elk or deer on the first day I hunted. The next morning I got up and discovered a herd of elk down in the bottom of what looked like a deep, dark hole in a canyon, about 1-1/2 miles away. The hole actually was an 800-foot drop down in the canyon. Moving slowly and getting me to a place where the elk couldn’t spot me required about 1-1/2 hours. Once I was within 400 yards of the elk, I took my shoes off and started calling like a cow elk, as I moved closer and closer to the herd. A couple of times a couple of cows in the herd either saw or smelled me. Even though they ran off a little ways, they weren’t totally spooked. When I finally got close to the herd, I sat down in front of a tree. I had elk from 25-50 yards from me. One of the bulls in the herd was a freak with 5 points on one side of his rack and 3 points on the other side that was chasing a cow. When the cow stopped, that bull stopped, and I shot him at 35 yards. I like taking freaky-racked bulls. Anytime one of those kinds of bulls gives me a shot, I’ll take him. I had to make two trips back and forth to my truck to get the meat out and another trip back and forth to get my camp out. That was when I could tell that my strength and conditioning practice and the Train to Hunt competition had paid off. On the two trips with the meat that I made to my truck, I had to climb out of that 800-foot hole with all that meat weight on my back.